14th November 2017 Technical Weekly, Prague. This Tuesday 14th of November 2017, several articles were published in the media of Czech Republic on our research findings. An interview of Prof. N. M. Bulgakova and Dr. T. Derrien has been published in Technical Weekly on the 14th of November 2017. This public review aims to inform citizens of Czech Republic on the latest public news about research and technology. It is mostly read by people from research and industry. A snapshot of the printed article is provided. The website only provides the first sentences of the article. The same interview has also generated a second full length article (in Czech) available on the website of Czech Television (Ceska Televize), the most important public funded channel in the Czech Republic. The Google Translation though reveals some inaccuracies, which could emerge from the automatic translation. As we didn’t get the chance to authorize the final version of the article, a list of inaccuracies is provided below. The news was also republished by Novinky.cz, 7th-8th most visited website in the Czech Republic (according to Alexa). 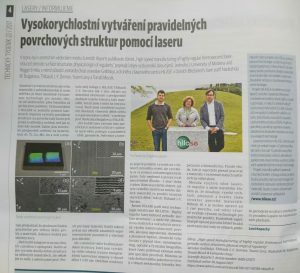 Finally HiLASE also republished the article in Czech (link to the article) on the laboratory web page. List of mistakes identified in the article of Czech Television. The original discovery of the large area processing at such level of regularity was demonstrated by the group of Jan Siegel and Javier Solis in CSIC Madrid, Spain (Optics Letters 2014). The limit of this study was found in the treated material: only Chromium could exhibit regular structures in the regime of removing matter with laser (named “ablation regime”). The novelty of our study lies in the theoretical model, which predicts the possibility to obtain high regularity on a large amount of metals as the experimentally observed regularity was successfully correlated with the distance on which some surface electromagnetic waves travel at the surface of the laser-irradiated metal. The contribution from our italian colleagues is found in the realization of the series of experiments performed on 6 metals, which support the theoretical analysis and theoretical predictions. The head of HiLASE is Dr. Tomas Mocek (see the page of staff on HiLASE website). Note that this mistake was introduced by Google Translate, and not by the authors. 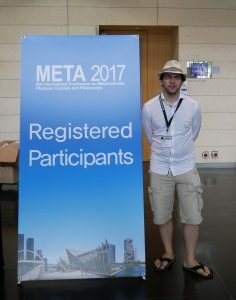 Report of the EU project QuantumLaP was submitted! We are happy to announce that our Marie Curie (H2020, EU) project “QuantumLaP” has now reached its maturity. The final report of the Marie Curie funding has been submitted on the 31st of October, after 2 years of great support from Marie Skolodowska Curie Actions for a total of 147,000 € over 2 years. 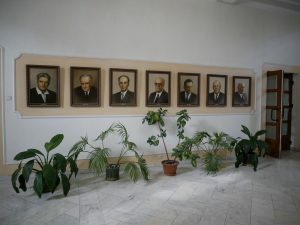 Nobel Prize laureates who have worked in Lebedev Institute, Moscow. I was honoured to give an invited oral presentation (30 min) at the Ultrafast Optics conference held at the Lebedev Institute, Moscow. The audience at this conference was truly exceptional. The impact of the talk was excellent and the questions from the audience were very constructive. Many thanks to Prof. Uryupin and to Prof. Kudryashov for the organization. Title of the presentation: Surface Plasmon Polaritons: their properties for different metals and the constitutive role in ultrafast laser processing. Our new publication is in Scientific Reports! We are happy to announce the publication of our manuscript entitled “High-speed manufacturing of highly regular laser-induced periodic surface structures on metals: physical origin of the regularity.” to the journal Scientific Reports of the Nature Publishing Group. In the paper, we at HiLASE developed the theory of surface plasmon polaritons for materials irradiated by intense laser light, and our co-authors in University of Modena (Italy) prepared laser-induced periodic surface structures at high throughput, competitive with other existing methods of lithography. Novelty of the study lies in the accuracy of the description that could be made a large range of materials, where the laser-induced nanostructures will be highly regular for developing nanostructure demanding applications. The study also reveals that reducing the wavelength of the laser may improve the regularity for seemingly any material. We hope this paper will help the large community of scientists and engineers working in this field to reach a better control of their laser-induced nanostructures in future. Our latest paper on the mechanisms of highly regular laser nanostructuring was presented at the Advanced Electromagnetics Symposium (AES), Incheon, close to Seoul, South Korea. Program of the AES symposium is available here. A new publication has been released in SPIE Proceedings. It presents a large scale model of ultrashort laser modification of semiconductors that was developed at Hilase to predict the changes of silicon material upon intense pulsed laser irradiation. A more complete publication aiming to demonstrate the level of prediction we have reached is under preparation. The paper is also available on our server. However, this link could be removed upon demand of SPIE in case. A 4-years PhD position has opened at Hilase (Prague, Czech Republic) on modelling of multilayered materials upon ultrashort laser irradiation. The offer is available here in PDF format. Research group is RP4 “Scientific applications”, with group leader Prof. Nadezhda M. Bulgakova. Informal supervisors of the PhD thesis are Dr Thibault J.-Y. Derrien and Dr Yoann Levy. Contract is for 4 years in international atmosphere and experimental context. Can start directly. Plasmonic toolkit now also works on Windows. One of the great advantages to develop with Python is the capacity to work on any environment. Hence, the “Plasmonic Toolkit” has now started its first steps on Windows today. Installation procedure is available here. Any issue can be addressed via email for debugging. Please don’t forget to attach your error messages. Report on the QuantumLaP project will be presented as a 1h seminar at Hilase Centre, on the 28th of March 2017, 2pm. Using intense laser beams, materials can be functionalized by inducing local modifications of the surface topography and/or the band gap, and by triggering local chemical reactions (oxidation, bond restructuring, etc.). Impressive capabilities of ultrashort laser pulses have already enabled the emergence of a wide range of real-world applications, such as surface colorizing and wetting engineering. Novel possibilities are now being explored toward tabletop particle accelerators, high-harmonic generation, potentials of using mixed laser beams. Fundamental novelty behind these applications lies in the laser-induced modification of the electronic structure which is still poorly understood because of lack of ultrafast probing experimental techniques with nanoscale spatial resolution. In this context, improvement of available theories and modeling tools used for studying laser processing is highly demanded for bringing more understanding and accurate predicting of material evolution at nanoscale in a wide range of laser parameters. Developing a bridge between the classical descriptions with first-principle theories is an essential part of advancing laser processing technologies. 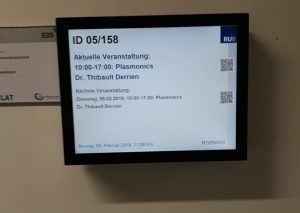 In this seminar, I will present how modeling the behavior of electron dynamics upon high intensity enables the possibility to perform reliable predictions for single- and bi-color laser irradiation of semiconductors [http://www.quantumlap.eu/]. Two different scales of the same physics will be addressed: modeling of the experimental effects (such as transient reflectivity change), and the corresponding quantum processes (time-resolved dynamics of electron excitation in bandgap material).